City Centre Suhar ... a fully-integrated retail, dining, and leisure destination. 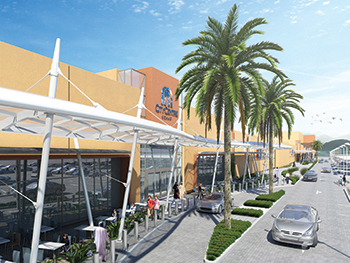 The mall is the fourth shopping and leisure destination in Oman for the leading shopping mall, communities, retail and leisure pioneer across the Middle East, Africa and Asia and will serve a population of 570,370 residents in Sohar, a burgeoning port city and industrial hub, and the surrounding districts, Liwa and Shinas. Conveniently located on Batinah Highway, City Centre Suhar has added 35,301 sq m of gross leasable area to the sultanate’s booming retail sector. With 129 retail outlets, a 7,348-sq-m Carrefour Hypermarket (its 12th outlet in Oman), a nine-screen VOX Cinemas, Magic Planet and over 1,000 available parking spaces, City Centre Suhar is a fully-integrated retail, dining, and leisure destination that is a new social hub for people to meet and connect. Sustainability was a key factor in the development of the mall, which boasts an environment-friendly design and innovative architectural details that underscore Majid Al Futtaim’s goal of becoming net positive in carbon and water by 2040. City Centre Suhar has set a target to achieve Leed (Leadership in Energy and Environmental Design) Gold status – the coveted energy-efficient design certification – within three months of opening which is the minimum requirement to collate operational data. This includes implementing sustainable building best practice with enhanced insulation, irrigation by condensation, LED lighting and solar panels that will contribute to the centre’s energy requirements. City Centre Suhar hosts some of the most sought-after international and regional retail brands such as The Body Shop and Max Fashion, exciting entertainment and leisure experiences, and varied dining options from cafes to family restaurants. City Centre Suhar is part of Majid Al Futtaim’s strategy to increase its total investment in Oman to $1.8 billion by 2020, which includes Mall of Oman that is set to be the largest shopping centre of its kind when it opens its doors in 2020. With over 130,000 sq m of gross leasable area, Mall of Oman will feature 350 stores. The company’s other developments include the recently opened My City Centre Sur, the sultanate’s first community shopping mall. Al Mandhari says Majid Al Futtaim is committed to delivering an unrivalled retail and lifestyle experience to growing cities in Oman, and the opening of City Centre Suhar achieves a major milestone in its investment strategy for the sultanate. Majid Al Futtaim’s investment in Oman’s retail, leisure and entertainment infrastructure supports the country’s National Strategy for Tourism 2040, which targets a six per cent rise in the contribution of the tourism sector to GDP, and a near doubling of visitor numbers to five million annually. Founded in 1992, Majid Al Futtaim has since grown into one of the UAE’s most respected and successful businesses spanning 15 international markets, employing more than 44,000 people, and obtaining the highest credit rating (BBB) among privately held corporates in the region. It owns and operates 24 shopping malls, 13 hotels and four mixed-use communities, with further developments under way in the region. The shopping malls portfolio includes Mall of the Emirates, Mall of Egypt, City Centre malls, My City Centre neighbourhood centres, and four community malls, which are in joint venture with the Government of Sharjah. The company is the exclusive franchisee for Carrefour in 38 markets across the Middle East, Africa and Asia, and operates a portfolio of more than 258 outlets in 15 countries. Majid Al Futtaim also operates 355 VOX Cinema screens and 37 Magic Planet family entertainment centres across the region, in addition to iconic leisure and entertainment facilities such as Ski Dubai, Orbi Dubai and Ski Egypt, amongst others.